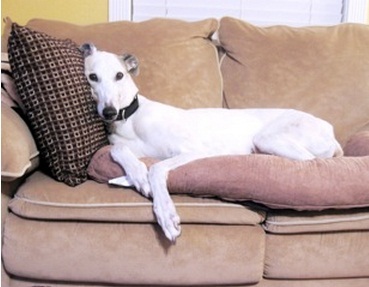 Thirteen years ago, before I knew that dog rescues existed, I came across a website that talked about finding homes for retired racing greyhounds. I thought that was the most awesome thing that I had ever heard and began to do more research. I had to build my case so that I could talk my husband into opening our home to one of these graceful and beautiful Greyhounds. We were dogless at the time as we had just gotten married and neither of us had any pets. But before I could bring it up to him, he brought an adorable Shepherd mix puppy home one day who stole my heart, but put my greyhound plans on the back burner. Over the years, I became immersed in the animal rescue world myself, and we adopted several dogs from the animal shelter where I volunteered. Last year, we sadly lost 2 of our beloved dogs, one of which was the Shepherd mix that had graced our home as a puppy thirteen years before. This left us a one dog household. 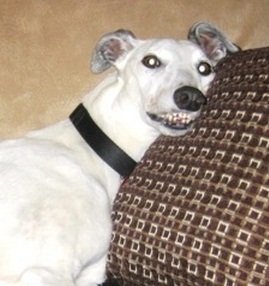 I knew that now was the time, and I was determined to add a greyhound to our family. I saw Mona online, a beautiful white grey, and knew she was the one. We drove the 4 hours to a GALT meet & greet and that sealed the deal. She is a wonderful girl and quickly fit right into our small pack. She has taken command over our couches, and her favorite thing in the world is a joyride in the car. We laugh at her "bubba teeth" grin every day, but she is perfect in our eyes and we wouldn't trade her for the world!